Updates, contents and information can be found on the CD page. This survey was undertaken by the group in February 2005. The results have been put into a database. Any access issues were passed on to the appropriate people. 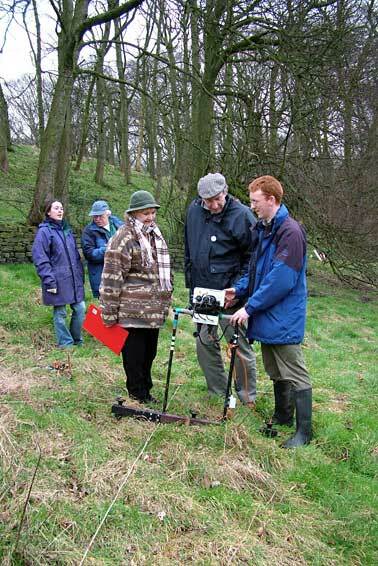 The Friends of Judy Woods decided on the Dept of Archaeological Sciences at Bradford University to undertake the geophysical and ground surveys in the woods. These surveys started in March 2005. We know that the woods have been used for coal extraction, so hopefully we will find lots of evidence and who knows what else we will find! 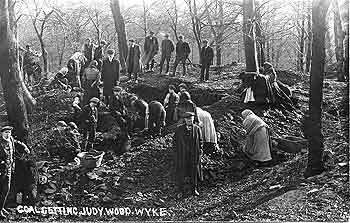 Postcard of 'Coal getting' in Judy Woods, possibly in the 1912 coal strike? Geophysical survey on the site of Judy North's cottage The survey report of Judy Woods by the University of Bradford. 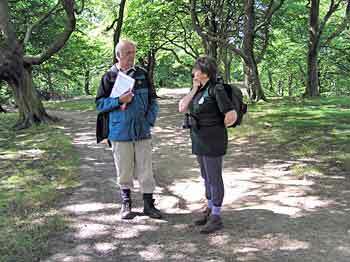 The archaeologists (Diane Charlton and Alison Tigg) from Bradford University have led a walk in the woods. They have also been into Woodside Primary School to show year 4 pupils how to find pottery fragments in sediment. 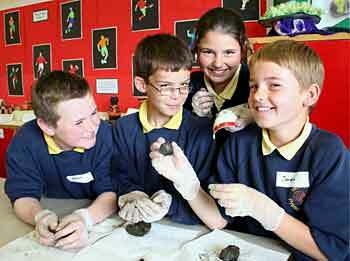 Sean Wrightson, Jack Appleyard, Samantha Waller and Jordan Mortimer from Woodside Primary School show off their finds. (Photo: D. Charlton, Bradford University). A group of twelve people undertook two days of training in November 2004. Our trainer, local drystone waller Paul Hallam, taught us some of the art of this traditional craft. 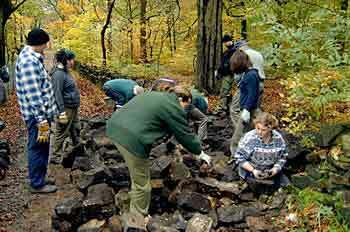 We were able to repair two sections of drystone walling along the track leading into the woods from High Fearnley Road. Thanks to Joan Dobson, we have very good records for the following - ferns, grasses, rushes, sedges, wildflowers and fungi. 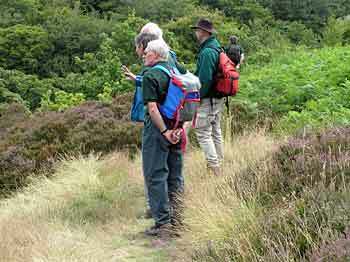 Mark Dovestone from Bradford Ornithology Group (BOG) has also undertaken Common Bird survey for the group. 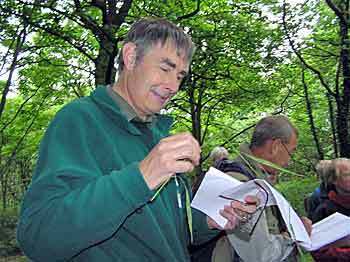 Ian Butterfield from the Forest of Bradford (FoB) has undertaken a butterfly survey. 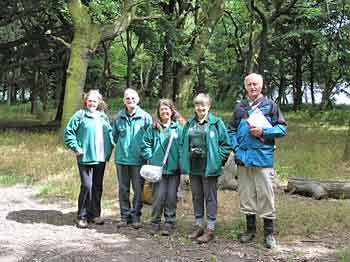 To help us with the NVC (National Vegetation Classification) survey, a few members of the group attended a training course led by Geoffery Wilmore in Calverly Woods - please take a look at the photos below. An NVC survey assesses the structure (i.e. the trees, flowers and grasses) of the woodland and how they relate to their location. Mary Twentyman (FoJW) & Geoffery Wilmore inspect a tree. Geoff Twentyman (FoJW) studies some creeping soft grass. 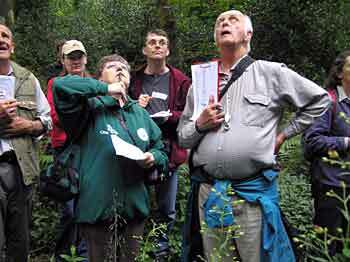 On Sunday 7th August, Geoffrey Wilmore led some of the Friends of Judy Woods on an NVC survey of Judy Woods. Invertebrate and dragonfly surveys have been made. Geoffrey points out habitat features. A geology survey has been undertaken and a report filed. As a result we now hold Geology walks each year to help explain our findings. The image opposite shows sedimentary rock strata typical of the region. 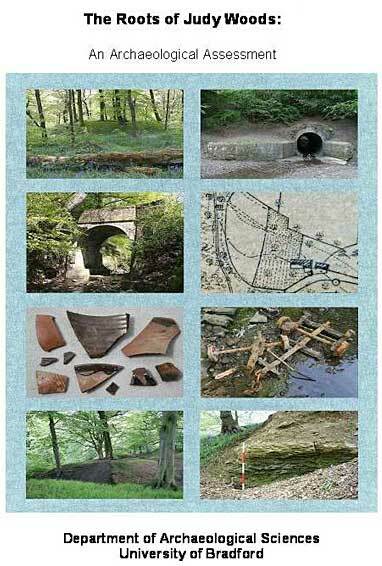 These have been undertaken by the group and Bradford Council will compile them into their database. 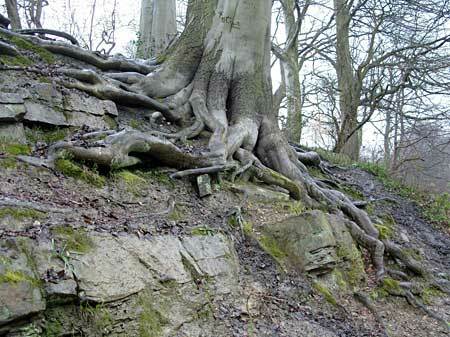 The full details of all these surveys are contained on the Roots of Judy Woods CD.